The goal of this project is to digitize an existing, award winning interpretive heritage trail, adding archive slides and GPS capability, so that someone with a smart phone will be able to easily link to location-specific content as they explore Bowen Island. The Blair Rifle Range Commemorative Plaque project is part of the BC Labour Heritage Society's "Remembering Working People: Plaques Around the Province Project." Through "Remembering Working People" cast bronze plaques that describe aspects of British Columbia's labour history are installed around the province. This project aims to extend the successful 2010 exterior signage project at the Vancouver Convention Centre to areas outside of Vancouver. 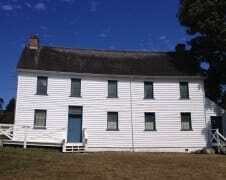 The purpose of the project is to fully research and document the complete history of the Craigflower Schoolhouse. There have been articles written over the years, but the whole story has never been told. The Hallmark Heritage Society will create permanent online and physical displays that include transcribed historic documents, archival photographs, and stories from the local community. The Mackie Lake House is a historic site that has deep connections to the Vernon and Coldstream communities. This project will involve the creation of 15 informational signs to be situated throughout the Mackie House grounds, which will allow event attendees and visitors to independently learn the basic history of the site. The Mackie Lake House Foundation will also host more detailed information on its website. The Vancouver Heritage Foundation will create an information-rich website as the next phase of its Places That Matter (PTM) program--a plaque project that begin in 2011 to celebrate Vancouver's 125th anniversary as an incorporated city. Each of the 125 community-nominated sites will feature on the website with their own page. The aim is to further engage community members by providing a sustainable and accessible digital space for sharing information and photographs, while telling inclusive and comprehensive stories. This project is an initiative to freely preserve heritage materials and information from the original Hollyburn Lodge structure that will not be used in the new lodge, but still retain significant historical or informative value about the site. They are to be housed and displayed in a free-standing kiosk adjacent to the new Lodge, allowing visitors to engage with these materials, view photographs, and read about Hollyburn while retaining a clear view of it and the place in which it is situated. 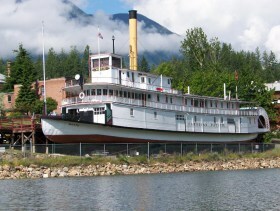 The SS Moyie is the oldest intact passenger-carrying sternwheeler steamer in the world, dating from 1898. On her retirement in 1957, the people of Kaslo, B.C. acquired the ship and preserved her on the shore as an historic site and museum, and in 1958 she was designated as a National Historic Site. In this project, the Kootenay Lake Historical Society will produce six interpretive panels with content and design related to the SS Moyie National Historic Site and its adjacent heritage precinct. As a cultural landscape, Crater Mountain is reflective of a broad complex of archaeological and historic sites, cultural resources and features, and spiritual values integral to the identity of the Similkameen peoples. The Crater Mountain heritage awareness project will result in the development of interpretive signage to be installed in kiosk displays at camp and recreation sites located along the Ashnola River. This project is part of a larger initiative to educate the public regarding the importance of mountain sheep in the contemporary landscape culturally and historically, including the collaborative efforts being made to improve their habitat and rate of survival. This project is to create two new interpretive signs for Calvary Cemetery--the oldest cemetery in Rossland. The Calvary Cemetery had its first burial in 1896, and has been used as the final resting place for members of the Sacred Heart Parish since its consecration. One interpretive sign will be used at the entrance, and the second will show the location of graves in the cemetery with family names to help visitors orient themselves. Stories of B.C. will create a permanent web-based exhibit, as well as a multi-location series of exhibit presentations, of a minimum of 15 Heritage Fairs projects created by youth in Grades 4 to 9 that focus on what each author values about B.C. history and heritage resources. This project aims to preserve Oliver's first police station, a 91-year-old shake roof using the modern equivalent of historic materials. It is one of the three oldest buildings in town and houses the Museum and its collection of local artifacts. The current roof is in very poor condition and poses a significant threat to the integrity of the building and the exhibits and collections it currently houses. The Unitarian Church of Vancouver, at 49th Avenue and Oak Street in Vancouver, is a Heritage A site on the City of Vancouver's Heritage Register. This project will replace skylights and repair the Sanctuary roof. 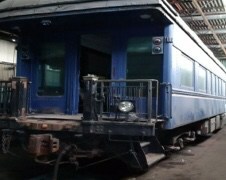 This project aims to restore the Northern Summit business railcar, used by Premier WAC Bennet (and subsequent premiers of the province), to its 1950's configuration and condition, and to transform it into a display and exhibition item at the West Coast Railway Heritage Park in Squamish. The goal of this project is to preserve the Walter Morgan Studio located on the Sybil Andrews property in Campbell River, B.C. Both Walter and Sybil were integral to the development of the arts in the local community, and the cottage remains a popular meeting place and inspiration for artists in the community. The City will be preserving the building envelope, board and batten siding, porch and configuration of the studio. Special attention will be given to the preservation of the unique windows that were built by Walter with materials available at the time. 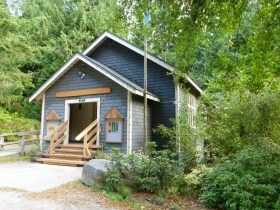 The South Galiano Community Hall is a simple wood-frame structure situated on log foundations and constructed in 1927. This project will replace the Hall's current wood floor, which was installed in the 1940s, with fir floors and will restore its original alignment. Through the rehabilitation of a 90-year-old squatters cabin, this project will develop the "Blue Cabin" as an off-the-grid floating artist live/work residency space that moors at different sites along the region's waterways. The scope of work focuses on exterior remedial work, including: documentation and cataloguing of current condition, structural reinforcement including floor and box joists, and refurbishment of doors and windows. One of the Port Clements Historical Society's most striking outdoor displays, a 009 Model 3 Madill Yarder, will be restored in this project. Restoration activities include replacing four of the six guylines and the wooden deck, and lowering the 90-foot steel spar so it can be cleaned and repainted, and lifted back up.